Megan has good fleece is a rich chocolate brown in colour - dense with considerable crimp. Of note is the colouring of her head and muzzle which are tinged with black, shading into black ears. She also has black "socks". She gets along well with our other females and she is very gentle with people. 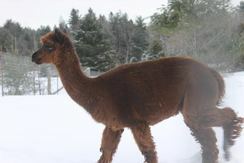 Megan was shown only once at the 2007 Alpaca Ontario Show where she placed in the middle of a very large colour class. In 2008, she was bred to HA Desert Commander and produced an excellent male cria - EAF Mordecai. 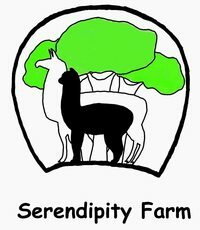 In 2012, she was bred to SSA Sunset Riley and produced another male cria - EAF Megatron. 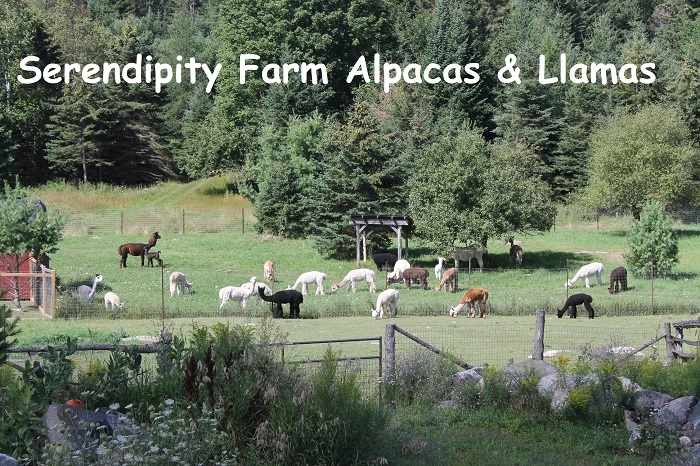 In 2013, she was bred to Victory's Aaron resulting is a healthy female cria - EAF Victory's Felicity. Megan had difficulty with her last cria delivery (prolapsed uterus) and should no longer be bred, nonetheless she is an excellent animal and would make an excellent companion and "lawnmower"!